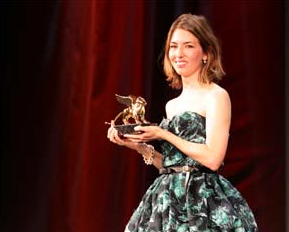 For this year's Venice Film Festival, the Best Film Award went to Sofia Coppola for her new film: Somewhere. The film is inspired by her experiences travelling with her dad and what it was like growing up to have a father such as Director Francis Coppola. Have a watch at her acceptance speech (above), the video will initiate in Italian. But stay tuned: The Closing Ceremony becomes quite interesting as Quintin Tarantino (this year's President of the Venice Film Festival Jury) takes the mike--attempting to make a passionate speech by making "stereotypical Italian gestures," and uttering a few badly pronounced Italian words. Tarantino has then been recently accused of showing preferential treatment towards the distribution of the awards based on his personal relations with the winners: including ex-girlfriend Sofia Coppola, friend Alex de la Inglesia (having won two prizes), as well as his long time friend Monte Hellman--who accepted the Lifetime Achievement Award.